It turns out Max isn’t just a handsome boy, he’s smart as a whip too. 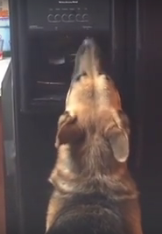 Max was apparently feeling a tad parched one day so he taught himself a super-cool new thirst-quenching trick. Well super-cool if you’re Max. That’s right he’s the MAN..uh… DOG! If you happen to be another member of the Hathhorn family maybe not so much. After their initial “Wow, what a clever pup!” moment they likely had the sinking realization that they had been sharing spit with their pooch. 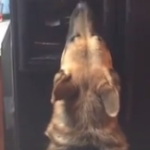 That’s right, Max (the dog) taught himself how to get water from the dispenser on the refrigerator door. Next Post This just in…planets are gorgeous!